Awhile back, we spotlighted the traditional Italian meal structure, which takes you through a journey from start to finish. The traditional Italian meal is about taking your time and enjoying every course. From the saying L’appetito vien mangiando, we understand that “the appetite comes while you are eating.” No wonder, from start to finish, the courses are designed to build upon one another to grow your appetite. A traditional Italian meal comprises of at least nine courses – three times what we Americans tend to think of us as a full meal! Sitting down, you are greeted with aperitivo, with a bubbly beverage and small dishes of nuts or cheeses to get your taste buds ready. The starter that we’re familiar with, antipasti, will be heavier than the aperitivo, with cured meats, bread, fish, or bruschetta. Primi comes next, usually with the highlight of a luxury gourmet ingredient, such as truffle; you may find risotto, seafood, or pastas in this course. Up next is secondi, a heavier course with some sort of meat, whether it is a “meaty” seafood such as lobster, or traditional meats such as chicken, lamb, or pork. Alongside the secondi are contorni – think of them as side-dishes. Usually these dishes will consist of a raw or cooked vegetable, served on a separate plate. Another option is insalata, a salad, if vegetables are not served in the contorni. Usually, a palate cleanser of sorbet is served after the secondi and contorni. Whew! Now that’s a mouthful. But it’s not over yet! Fruit and cheese are served near the end of the meal, in the formaggi e frutta course. Depending on the region, the pairings of fruit and cheese will differ. And finally, we hope you’ve saved room for the dolce. Dolce is the Italian word for “sweet,” and it also signals dessert in your meal. Through Italian culinary history, dessert has been an important part of the meal. Food historians believe that the first desserts were breaded sweets. Tracking the history of food, we find that sugar was a luxury, but of course, we find a way to get our fix! In Italian cuisine, you’ll find natural sweetening from fruits and honey, to substitute sugar. For example, in panforte or biscotti, you’ll find dried fruits baked in, to add a sweet pop. As sugar became more available to common households, desserts in Italy had something of its own Renaissance. 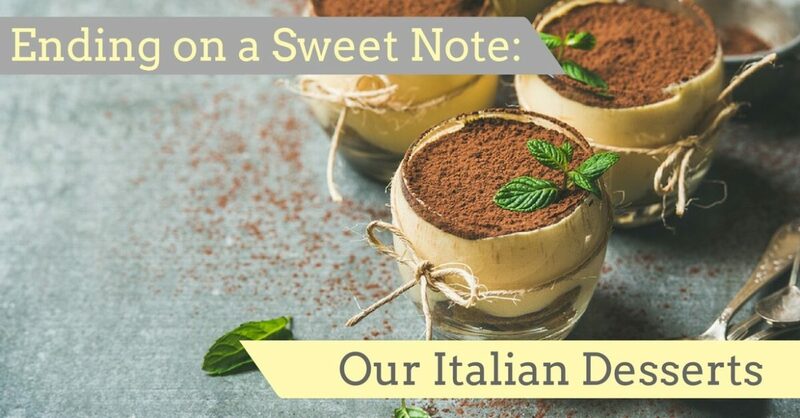 In addition to panna cotta, marzipan, cookies, and so much more, sugar played a key role in the development of some of the most famous of Italian desserts: tiramisu and cannoli. As with most favorite popular dishes, tiramisu has a long, oft-disputed history. Some historians believe that tiramisu originated in the 17th century and was introduced to Duke Cosimo de Medici, who was head over heels for it and popularized the dessert. Tiramisu, in Italian, means “pick me up,” “cheer me up,” and “lift me up.” This has to do, in part, with the coffee in which ladyfinger cookies are dipped, before they are layered. Here at Cucina Toscana, we prepare tiramisu in the traditional Italian way, with mascarpone cheese and cocoa powder. What better way to end your meal? Cannoli originates from Sicily (as does The Godfather), and its name means “tubes.” This cylindrical fried pastry is filled with sweetened ricotta, which may be scented with cinnamon or rosewater. Sometimes, you’ll find cannoli coated with chocolate or sprinkled with pistachios. Here at Cucina Toscana, we serve it with chocolate and a topping of fresh fruit. Come join us at our Italian table at Cucina Toscana! And don’t forget to leave room for dessert!